Bangkok (Thailand) – August 23, 2018 (travelindex.com) – Mövenpick Hotels & Resorts has expanded its Thailand portfolio to nine properties Kingdom-wide after signing an agreement to rebrand and manage the renowned Nai Lert Park Hotel in Downtown Bangkok. 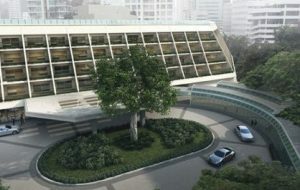 The iconic upscale urban resort strategically located on Wireless Road in the Central Business District, yet nestled in an oasis of lush landscaped gardens set back from Bangkok’s bustling streets, will re-open under Mövenpick’s management in early 2019 after a comprehensive refurbishment programme. Offering 294 stylish guest rooms and a wide range of business and leisure facilities, it will be the hospitality firm’s third property in the Thai capital, joining Mövenpick Hotel Sukhumvit 15 Bangkok and Mövenpick Residences Ekkamai Bangkok. Close to major attractions, malls, embassies and corporate offices and within walking distance of Ploenchit BTS skytrain station and Phetchaburi MRT metro station, the property offers guests convenient access to the entire city. “Opportunities to manage legendary hotels do not arise often, and we’re delighted to bring Mövenpick’s signature style to the Nai Lert Park Hotel, which has been a Bangkok landmark for more than three decades,” commented Andrew Langdon, Chief Development Officer for Mövenpick Hotels & Resorts. “We look forward to moving this captivating property into an exciting new era as we introduce a health-conscious generation of guests to Mövenpick BDMS Wellness Resort Bangkok and further provide world-class wellness facilities in association with the adjoining BDMS Wellness Clinic,” he added. Bangkok Dusit Medical Services Public Company Limited (BDMS) was established on 30th October 1969. Through business expansion, the Company was listed on the Stock Exchange of Thailand on 2nd October 1991 and registered its conversion to public company limited in 1994. BDMS is ranked in the top five private hospital groups globally in terms of revenue, one of the most prestigious hospital networks in the Asia-Pacific region with a total of 45 hospitals across the network that have been accredited by the Joint Commission International (JCI). BDMS offers world-class medical care and treatment to both local and international patients, complemented by the latest medical technology. All rooms and suites will feature contemporary designs and high-tech amenities while resort facilities will include a large freeform outdoor swimming pool, fitness centre and wellness spa. The hotel’s restaurant will serve all natural, organic Thai and international cuisine, the lobby lounge will offer all-day health-conscious refreshments and the pool bar will provide the perfect spot for informal gatherings. Mövenpick BDMS Wellness Resort Bangkok will also become a preferred meetings and events destination with its ballroom and function rooms featuring natural light and direct garden access, able to cater to groups of all sizes, from intimate social occasions to large-scale corporate conferences, while the hotel’s garden provides a romantic setting for al fresco events and weddings. The Nai Lert Park Hotel originally opened in 1984 but closed its doors at the end of 2016 to undergo a complete refurbishment. When it opens next year, it will offer guests the high-quality international standards and facilities for which Mövenpick Hotels & Resorts is known. Mövenpick Hotels & Resorts is a modern, international upscale hotel management firm with a we make moments business philosophy, recognising that small gestures make a big difference to its guests, business partners and its workforce of more than 16,000 team members. The company manages more than 83 hotels, resorts and Nile cruisers across Africa, Asia, Europe and the Middle East and is on track to meet its target of operating 125 properties by 2020. Headquartered in Baar, Switzerland, Moevenpick Hotels & Resorts’ values reflect its Swiss roots and rich culinary heritage and it is passionate about delivering gastronomic excellence and intuitive service – all with a personal touch. Book your Moevenpick hotel in Bangkok and around the world in 55 countries at best rates available. Pay at the hotel. Book now at HotelWorlds.com and Earn HolidayClicks Points for every dollar spend!